NGC 7662 "The Blue Snowball"
30-inch (0.76-m) f/6 telescope, Steve Brewster used SRO's Apogee AP8p camera, 2-minute exposure, false-color added. 30-inch (0.76-m) f/6 telescope + SBIG ST6 camera, red filter, 5 images each 10 seconds, taken May 05, 2002. This B&W image has been color processed to show details of the material inside of the ring. Abell 12 (mag 14), upper right of bright star Mu Orionis (mag 4.1), was photographed by Mike O'Neal on November 8, 1986 using Kodak 2415 Tech Pan film on the 30-inch (0.76-m) f/6 telescope. Exposure time is unknown. 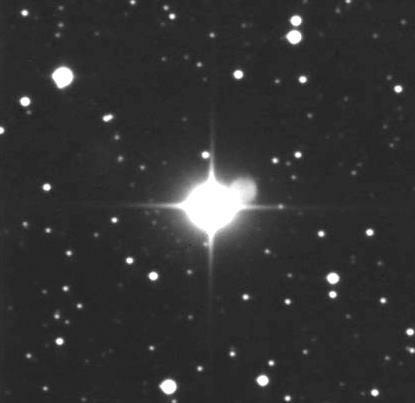 Imaging a faint object very near a bright star is very challenging. 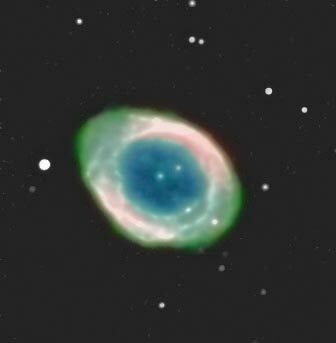 M-27 was the first planetary nebulae ever discovered and is one of the largest and nearest to Earth. 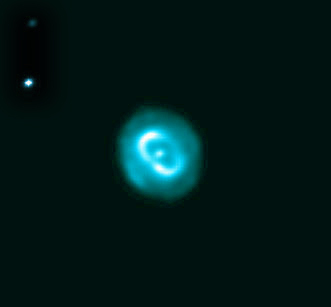 This image was made by Tim Cann using an SBIG ST-1001E camera on the Stony Ridge 0.76-m f/6 telescope on August 1, 2002. On a dark night with still seeing conditions, the image was exposed for 60 seconds.